Support for the phyWAVE evaluation board. The Phytec IoT wiki describes the phyWAVE module and the phyNODE board more detailed. The links below will guide you directly to the corresponding chapter: Overview Introduction Hardware descriptions for the phyWAVE and the phyNODE Toolchain, build and debug Information A detailed step-by-step Guide that explains how to set up the Environment The implementation status of the phyWAVE and phyNODE peripherals are listed below. You can find links to the corresponding Pull Requests which may give you a code reference. 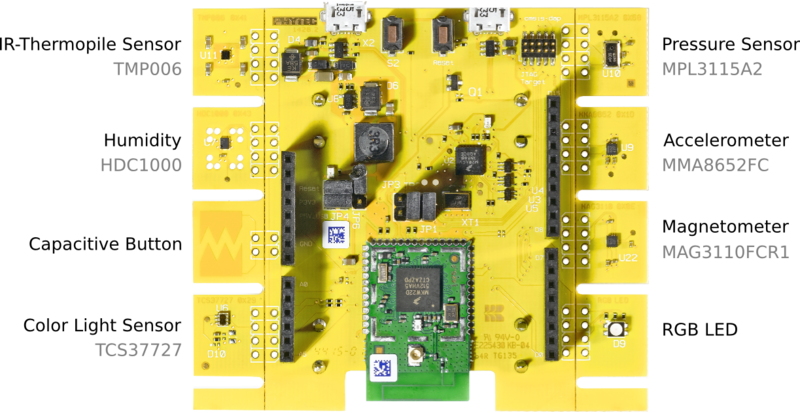 phyNODE board with equipped phyWAVE-KW2x processor/radio-module. The PCB-pieces with the mounted sensors can be separated from the evaluation board to capture sensor values from specific spatial points. Board specific definitions for the phyWAVE evaluation board.